The election was held on 10 December, 1949. In 1944 Menzies formed the Liberal Party from what was left of the United Australia Party after its heavy election loss in 1943. The dominant theme of the election was the plan by Prime Minister Chifley to nationalise Australia’s banking system. The banks challenged the proposal in the High Court, with the Court finding in favour of the banks on 11 August, 1948. Chifley appealed the case with the Privy Council in London July, 1949, but the decision was upheld. Also, a coal strike that had begun on 29 June, 1949, caused Chifley to enact emergency legislation and gaol mine leaders. 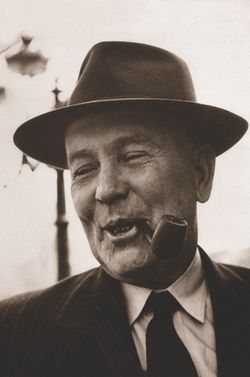 Joseph Benedict Chifley was born 22 September, 1885 and died 13 June, 1951. Chifley was the Prime Minister of Australia 13 July, 1945 to 19 December, 1949. He was the Leader of the Australian Labor Party. He represented the electorate of Macquarie, New South Wales from 1928-1931 and from 1940 to 1951. The Commonwealth Labor Government brings to you, the electors of Australia, an account of its administration during the three years since you returned it to office; a review of how it has sustained the trust you gave to it when the call for national leadership went out in 1941; and its plans for the future, greater Australia. You will recall that in 1941—after two years of war—the Liberal Party and Country Party coalition Government led by Mr. Menzies came to an unprecedented ending when his own party deprived Mr. Menzies of the leadership. You will recall, too, that a new Government led by Mr. Fadden was also torn by internal dissension and jealousy. It could not survive and, eventually, the then Governor-General (Lord Gowrie) sent for the late Mr. John Curtin to form a Commonwealth Labor Government. And so, in war and in peace, this nation has been served by a Labor Government. It was able to organise the fighting forces, the working front and the economic resources of the nation, on a scale unknown in our history. With the valour of our fighting men and women; the magnificent response of the labor force and the whole-hearted co-operation of the Australian people generally, the war was carried on to a successful conclusion. Even before the war had ended, the Labor Government began planning for the peace. You know of the success that attended the demobilisation of the forces and their rehabilitation into civilian life. These schemes have been carried through in a manner that has not been bettered anywhere in the world. When, after five years in office, the Labor Government went to you, the people, in 1946, you were told of what had been accomplished and of what was planned for the future. There were no glittering promises. A straight, honest undertaking was given that the Labor Government, if returned, would do everything possible to make Australia a better place for all Australians. It is my duty tonight to show how that undertaking has been kept and to say to you simply: if you return the Commonwealth Labor Government, it will continue to carry out that pledge. Further, I say this to you: our opponents will raise bogeys and whip up side issues. There will, no doubt, be passionate declarations of what our opponents will do about Communism. They have been saying the same thing for 20 years or more. There will be scares about nationalisation. There will, no doubt, be emotional appeals on behalf of the British Medical Association which stands in the way of the sick receiving medical benefits. The Government will treat all this with the contempt it deserves because we believe that the intelligent electors of this country want to know the programme of each political party; whether a party has a forward-looking policy and not just a return to the past; and they will then form their own judgment. There has never been any mystery about the Labor Party's policy and platform. It is known to all; whether it deals with social security; shipbuilding; banking or help for Britain. My colleagues and I ask that you judge us on our record and on our ability to go on with the job of building Australia into the nation we all want it to be. The concern of every individual is not only for the community but also for his or her own economic and social welfare and I now review briefly the policy followed by the Labor Government and its estimate of what the future may hold. The Labor Movement exists to promote social and economic security for the people, higher living standards, and the progressive expansion of Australia as a nation in the world community of nations. Through the past eight years, the Labor Government has steadfastly pursued these aims and, despite the war and the difficult conditions which followed the war, it has gone far towards achieving them. Full employment has been maintained. The economy has been strengthened against the possibility of depression. A wide system of social services now offers protection to the individual against misfortunes of unemployment, sickness and old age. Great headway has been made with the Migration programme. Huge developmental projects have been put in hand to open new resources and provide the foundation for the expansion of all kinds of industries. Before the war—and for as many years back as we care to go—it was the usual thing to have eight or ten per cent of unemployment in Australia. Often the rate went higher than that and in the depression it rose above 30 per cent. That meant want and degradation for the unemployed and their families. For those in work it meant ceaseless fear of losing a job. For business people it meant slack demand, low returns and unsaleable stocks. For the farmer it meant low prices, unpayable debts and often foreclosure on his property. For the community as a whole, it meant stagnation, wasted wealth, a falling birth rate, frustration and bitterness. The Labor Government has shaped all its financial and economic measures towards maintaining full employment and it will continue to shape them so. So far as it can humanly contrive, never again will the dole queues be seen in this country. Never again will competent workmen stand idle for months and years while limitless work remains to be done. Never again will young men drift hopelessly from town to town and from State to State, searching for the jobs which, in all this wide land, did not exist for them. During the last four years all the men and women demobilised from the services—more than half a million of them—and all the people who worked in war industries have found peace-time jobs. All the boys and girls who have left school in those years, and all the new settlers coming to Australia have likewise been absorbed. Nearly everywhere today there is a shortage rather than a surplus of labour, and the total number of people at work has risen rapidly. At present, nearly 750,000 more people are at work throughout Australia than in 1939. Yet this policy of full employment is being criticised and derided! It is blamed for shortages, blamed for rising prices, blamed for strikes! You cannot have discipline and efficiency—so critics say—unless you have a degree of unemployment. Not too much unemployment of course—that would be bad for business. Just a nice six or eight per cent of unemployment, just a quarter million or so out of work to keep the fear of the sack in the hearts of all the rest. The Labor Government rejects this barbarous and intolerant view and dismisses as absurd the arguments used to support it. It is utter nonsense to say that unemployment would cure shortages—produce more goods, that is, by having fewer people at work. But full employment can be maintained only if positive measures are taken to ward off depressions and to ensure that as the economy expands and population grows there will be jobs available for those seeking them. In the present troubled state of the world, economic affairs can change quickly and suddenly for the worse and, linked as we are with many countries through our big overseas trade, a depression abroad can hardly fail to affect us seriously. A good deal has been done in recent years to buttress our position against adversity abroad. Financial reserves held overseas have been built up to a total in Australian currency of more than £450 millions and this should be a valuable stand-by if at any time our earnings from exports fall. Governmental debts abroad have been reduced in the past eight years by £117m. Australian pounds. Through this reduction of overseas debt and successful conversions of debt to lower rates of interest, the amount of interest payable annually abroad on account of Governments has been reduced since 1941 from £23 millions to £15 millions. Further the Labor Government negotiated with the British Government a number of long term contracts covering meat, dairy products, sugar, eggs and dried and canned fruits. The effect is that producers are guaranteed profitable returns on their exported products. Under the International Wheat Agreement, quantities of wheat up to 80,000,000 bushels each year for a period of five years can be sold within fixed price limits. For this year the minimum is about 13/4 a bushel and the lowest price that can be paid in any one year is 10/8d. a bushel. Business firms, farmers and private individuals have been able in recent years to pay off debts and to accumulate financial reserves which will stand them in good stead if difficult conditions return. Savings Bank deposits, for example, have trebled since 1939 from £245 million to £720 millions last June. Low interest rates will help in the same direction. Before the war overdraft rates ranged from 5 to 6 per cent and higher. Since 1945 the maximum rate has been fixed at 4½ per cent. Most other rates of interest have been similarly reduced. In past times nothing did more to discourage enterprise and burden the farmer, the home builder and the ordinary man and woman than the charging of excessive interest rates by financial institutions. As a safeguard against unemployment and a fall in incomes, the Commonwealth and State Governments have co-operated in building up a very large reserve of constructional works. By putting these works in hand, not only would employment be created directly but the demand for materials and equipment and for goods and services generally would be sustained. Let me turn now to the Budget, which has a vital place in economic policy. Social Service expenditure has been increased under Labor Governments from under £181,000,000 a year before the war to an estimated £lOO,OOO,OOO a year. In addition the National Welfare Fund has been built up to £100,000,000. Yet notwithstanding these great measures it was possible during the last two financial years of the period to balance the national Budget. In 1944/45, we had to borrow £266,000,000 for current expenditure. In 1947/48 and 1948/49 the whole of current expenditure was met from revenue without any borrowing whatever. In addition to this, very substantial amounts were put aside in reserves such as the National Welfare Fund and the War Gratuity Reserve. Thus the national finances have been placed in a remarkably sound position. That is another vital step to strengthen our economy and ensure stability of business conditions. But it is said by some that taxation should have been reduced further and expenditure curtailed. During the war, rates of taxation, especially direct taxation, were raised to very high levels. Since then, however, there have been five successive reductions in direct tax rates: For example, a man with a wife and two children earning £600 a year, now pays only £26 a year for social services contribution, as against £118 a year in income tax and social services contribution in war time. Further, this £26 is less than the combined Commonwealth and State Taxes paid by the same taxpayer in all States except one before the war. Remember, too, that the man concerned or his wife is now getting 10/- a week for child endowment and is eligible for other social services benefits as well. The great body of taxpayers—all, in fact, except the few on very high incomes—are now paying much less than half the direct taxation they would have paid on their present incomes if war-time rates now applied. At the present time 75 per cent of taxpayers pay only social services contribution, the maximum rate of which is 18d. in the £. A single person does not now become liable to income tax as apart from social service contributions unless his income exceeds £500 and a married person with two dependent children does not become liable to income tax unless his income exceeds £827 or nearly £16 a week. Indirect taxation, also, has been greatly reduced. Reductions in sales tax and other indirect taxes since 1946 have cost an estimated £35,000,000 a year. Sales tax has been eliminated from practically all food stuffs, clothing and building materials. Many material reductions have been made in Customs, Excise and Primage. Entertainments tax rates have been reduced by about one-fifth all round. The special reduced rate applicable to the legitimate theatre has been applied to sports such as football, cricket and certain other games conducted by non-profit organisations. The war-time company tax was abolished two years ago and so was the gold tax. On the basis of present incomes the direct and indirect tax concessions made by the Labor Government are worth nearly £300,000,000 a year to taxpayers. Of this amount £46,000,000 represents concessions which have come into effect during the present financial year. This policy of progressive tax reduction has been followed out step by step as financial conditions made possible. This is what, at the last election, the Government undertook to do. Taxation measures, like all other financial measures, have to be judged in the light of the overall position at any time. All told, it may be said that the Government has fulfilled its undertaking to make tax reductions as and when it could. All these items represent either past commitments such as those for war debt, or expenditure on defence, repatriation, social security, the running of vital services, payments to the States, or constructive national works. It is for the critics to say which of these they would eliminate or reduce. So far they have not done so either in Parliament or out of it. Yet in total, these items make up £523,000,000 of the aggregate of £567,000,000 —by far the greater part of the Budget. In the remaining £44,000,000, provision is made for current expenditure on civil aviation, immigration, the C.S.I.R.O. and a thousand and one other items essential for the government and progress of this country. Nowhere does there exist a great element of wasteful unnecessary expenditure which could be reduced and allow further big reductions in taxation to be made. In criticising the cost of administration, some people even decry the splendid work of the Public Service. Certain other fields of policy, going beyond the Budget, have a vital bearing on the welfare of our community. Monetary and banking policy is one of these. No factor counts more in the health of the economy, the state of employment and the expansion of industry than the control of money and credit through the banking system. The banking legislation of 1945 recognised this principle and under it the Commonwealth Bank was made responsible for controlling banking (other than State banking) in the national interest. That legislation, and the principle it embodied, were approved by the Australian people at the 1946 elections. But in 1947 it was challenged in ways that appeared to endanger the whole system of national control over money and credit. In particular, doubt was cast upon the validity of those sections of the 1945 Banking Act which enabled the central bank to control the huge volume of surplus spending power which had accumulated in the hands of the trading banks through the war and post war years. To lose control of these funds would have undermined the power of the Government and the Commonwealth Bank to restrain the forces of inflation which were strongly active within the economy and might well have led quickly to an unmanageable boom, from which depression and unemployment would inevitably follow. To ensure control of the monetary situation, therefore, the Government passed the Banking Act in 1947 which provided for the acquisition by the Commonwealth Bank of the business and assets of the private trading banks. Full provision was made for compensation to the shareholders of those banks and generous conditions were offered to the staff of the banks. The validity of this legislation was challenged successfully in the High Court and an appeal by the Government against the High Court decision was rejected by the Privy Council. The Government cannot go beyond its constitutional powers. The Constitution can be altered only by a vote of the people at a referendum taken specially for that purpose. But the Government has a responsibility, which it will uphold to the utmost of its powers, to ensure that our resources of money and credit are used to the best advantage of the community. It will proceed with its policy of expanding tho services of the Commonwealth Bank to provide an efficient and comprehensive system of banking. More than ever now it is necessary that a strong forward movement of our economy would be maintained. The war showed up the difficulties of our defensive situation, in particular the need for more people and for the expansion of key industries. Migration plans on a scale not attempted before in this country are the answer which the Government is making to the population problem. Industry is primarily a field for private enterprise, but the Government can assist. It has assisted in recent years to establish and enlarge industries in Australia on a scale unparalleled in our history. But it rests with governments to provide the basic works which open up resources and give the essential facilities of transport, power and water supplies which industry require. The Commonwealth Labor Government in co-operation with the States, and in some cases on its own account, is carrying out great undertakings in many parts of Australia which will pave the way for new industries, increase the output of present industries and make possible the growth of new communities. In brief, now that the war and its troubles have largely receded into the past, the grand aim of policy should be to take up the tasks of national development on a basis wider than ever before, bringing to the job all our resources and all our energies, with the same will and the same singleness of purpose as the Australian nation showed in the crisis of the war. I summarise the record of the Labor Government; ask you to weigh it against the past record of our opponents; and invite you to endorse our plans for the future. The Labor Government has increased the value of social services from under £181,000,000 a year before the war to an estimated £100,000,000 this year. The system of Social Service benefits which the Government has been developing over the years will continue to be developed in the light of economic and financial circumstances. In particular, consideration will be given to those pensioners whose income is wholly, or almost wholly, confined to their pensions. Employment is at an all-time high, unemployment is almost non-existent. The Labor Government in co-operation with all the State Governments has £743,000,000 of essential works ready to promote economic and social development in almost every locality in Australia. Since Labor took office, the number of factories has increased from 27,000 to over 37,000. Over 21,600 new manufacturing projects have been commenced in Australia over the last four years and 200 of them are from overseas. In addition, the Government has pursued a planned policy of de-centralising industry throughout country areas. The number of tractors in use in primary industries has more than doubled since pre-war years. The Labor Government believes in Australia and her future greatness. In the forefront are positive projects undreamed of ten years ago. These include the £200,000,000 Snowy River Hydro-Electric Power Authority. The Northern Australian meat production programme will develop the Northern Territory, the Channel country of Queensland and north-west Western Australia. It will assist Britain and also meet our ever-increasing needs. The Government is considering a joint effort with the Queensland Government to develop the Burdekin River irrigation scheme. An examination will also be made of the possibilities of joining with the Queensland Government in a plan for the development of the Callide coalfields and the Mareeba-Dimbulah irrigation project. In Western Australia, the Commonwealth Labor Government has made a grant towards the cost of the Great Southern water scheme. In Tasmania, the Commonwealth and State Governments are jointly establishing an aluminium industry. In war and in peace, the Labor Government has had a progressive programme to ensure continuing prosperity of Australia's agricultural, pastoral and other primary industries. Today, Australia's primary producers are in a better position than ever before in our history. The Labor Government succeeded where all previous Governments failed and has secured Australian-wide agreement on a wheat stabilisation plan. In 1947, the Labor Government announced a five years' defence programme which is now estimated to cost £295,000,000. This is the first time in Australia's history that there has been a programme of such magnitude and giving continuity of development. The present strength of the permanent naval forces is 10,148. Before the war, the total was 5,264. Permanent military forces total 14,861 as against 3,863 in 1938-39. The R.A.A.F. has a strength of 9,073 but it was only 3,489 pre-war. The Labor Government's defence policy is to provide the most modern equipment for our forces. It is co-operating with Britain in a practical manner. It has plans for the expenditure of £33,000,000 for research and development of which the long-range weapons project is the main item. The defence programme is essentially based on co-operation in British Commonwealth defence. Britain is the heart of the British Commonwealth. It is vital to our own security and our economy that we continue to co-operate with the United Kingdom. Planning is actively proceeding between Britain, Australia and New Zealand on mutual defence. Immigration means security. Even more than that, it means the full development of untapped resources. It means greater production of goods and services. It means a better, happier, more prosperous life for every Australian. The great immigration drive, launched by the present Labor Government in 1945 and carried out with remarkable success, will be continued vigorously until Australia has the population she needs to achieve the development of all her resources and guarantee her security. The Labor Government has carried out faithfully its duties and obligations to Australia in the field of international relations. The Labor Government recognises that, without world peace, all social progress would be imperilled. It has, therefore, given its full support to the United Nations, through which it has made an outstanding contribution towards ensuring the effectiveness of international machinery to maintain world peace, order, security and improved economic conditions. Australia's efforts were recognised by the election of her Minister for External Affairs to the presidency of the United Nations. Before the war ended in 1945, the Labor Government initiated a concerted effort to speed up the erection of homes. Under an agreement with the States, £48,000,000 have been advanced so far to State Governments. In all fields of housing, 52,000 dwellings were built and 601,000 were under construction last year compared with an average of 27,000 for the ten years under anti-Labor Governments before the war. Education is primarily a matter for the States. The Commonwealth Labor Government, however, is assisting the States in many fields of education. As a result, the Commonwealth Government now provides £15,000,000 a year for education and research compared with half a million pounds in 1939. Recently, arrangements were completed for 3,000 students to be selected each year for scholarships. Further, a committee will examine the finances and developmental plans of Australian universities. An outstanding feature of the Labor Government's programme in the last three years was the establishment with the New South Wales Government of the Joint Coal Board to re-organise and re-equip the coal industry. About £20,000,000 is estimated as required to bring the coal industry up-to-date and £14,000,000 to develop the industry so as to give Australia the increased production of coal needed for Australia's expansion. In the coming year 19 open-cut mines will be in operation. The Labor Government has provided for ex-service men and women in a way that will bear comparison with any country in the world. The Reconstruction Training Scheme alone assisted 200,000 ex-service personnel. By contrast with the experience after World War I, the present War Service Land Settlement scheme has been an outstanding success. As in the past, the Government will give continuing consideration to the repatriation needs of ex-service men and women and, in particular, will review the assessment of the pensions of totally and permanently incapacitated members who depend on their pensions as their only source of income. Scientific research is a necessity for the maintenance of our standard of living and even for our survival. The Labor Government has developed and will continue to expand scientific research. The establishment of the National University at Canberra includes a programme of research in atomic energy under the distinguished Australian Professor Marcus Oliphant. The past three years have seen development under the Labor Government of great importance to national health, and it is a matter for regret that greater co-operation over a wide field of public health, extended by State Governments, the dental and pharmaceutical professions and proprietors of private hospitals, has not extended to the British Medical Association. The people are now dependent on the good-will of members of that association. The Labor Government will continue its endeavours to provide the people of Australia with medical benefits in accordance with Acts of the Commonwealth Parliament. Since the war, the Labor Government has followed a planned policy in regard to the shipping and ship-building industries. The Government is determined that Australia shall have a modern and up-to-date merchant marine in case of any future emergency. The Shipping Act passed this year is designed to ensure that all vessels for use on the Australian coast will be built in Australian shipyards. The Labor Government has endeavoured to provide Australia with standard railway gauges. An agreement involving a Commonwealth contribution of £17,000,000 has been reached with South Australia. Negotiations are proceeding with Victoria and Western Australia with the same objective. During the three years from July, 1947, the Commonwealth Labor Government has made provision for £23,000,000 for roads. Of that amount, £6,000,000 has been earmarked for roads in areas which are difficult of access. The last anti-labor Government provided only £111,000,000 for roads in the three financial years before the war. The Postmaster-General's Department is proceeding with a three-years' programme involving £35,000,000 and an important feature of the works being carried out is the improvement of facilities in rural areas. As I said to you earlier, our opponents will endeavour to catch votes by raising scares and bogeys. False and malicious statements are being circulated to the effect that the Labor Party intends to nationalise farms and homes and shops and all industry. Such statements are complete and utter untruths. The Labor Party has no desire and no plan to do anything of the kind, and moreover it could not do anything of the sort under the Constitution. And now, listeners, there is something which goes deeper than all that I have said. That is the welfare of the great mass of the people—the ordinary man and woman. The Labor Party, and I personally as one of its members, have always held as our fundamental objective the betterment of the people. Many of you will remember the period of the 30's onwards when banks and the Bank Board decided that the only way to restore financial stability was to reduce wages and pensions and to advocate measures that resulted in hundreds of thousands of breadwinners being thrown on to a pitiful dole. Farmers were sold up and shopkeepers closed their doors, and insecurity, misery and want were forced upon our people. We are determined with all the power at our command that that shall not happen again. I well remember when, by their thousands, breadwinners, ill-clad and underfed, queued at factory gates seeking work. We, the Labor Party, feel we have a sacred responsibility to see that all sections of the community receive justice, and that the less fortunate section of the community has protection from want, unemployment and insecurity. We affirm for every man the right to receive a fair return for his labour, enterprise and initiative. But we do say that it is the duty and the responsibility of the community, and particularly those more fortunately placed, to see that our less fortunate fellow-citizens are protected from those shafts of fate which leave them helpless and without hope. That is the objective for which we are striving. It is, as I have said before, the beacon, the light on the hill, to which our eyes are always turned and to which our efforts are always directed. We work and fight, not for personal gain, but that our fellow-citizens may labour under good and ever-improving standards and conditions, free from want, insecurity and misery. In its international policy, the Labor Government has and will continue to give, unwavering support to the Nations and the principles of the Charter. The Australian Government has consistently endeavoured to assist in establishing just and lasting peace based on those principles. So far, it has not been possible to create a system of global collective security among the great Powers. In the meantime, reliance must be placed on co-operation in British Commonwealth defence and in the development of collective arrangements on the pattern of the Western Union and North Atlantic Treaties. Arrangements of this nature are authorised by Article 51 of the Charter, which affirms the inherent right of collective self-defence. The long-term one is the development of the country with population and resources to provide a deterrent to aggression, and to enable it to make the maximum contribution to collective defence on a British Commonwealth, regional and world basis. The sooner Australia can develop a capacity to bear a greater share of the burden of British Commonwealth defence, the better it will be both for itself and the other members of the British Commonwealth. The short-term consideration is the extent of the diversion of manpower and national resources which should be made from the development of the country for the provision of defence, and the form in which this defence should be provided. The financial commitments required to be provided for in the budget for post-war charges for war services, as well as for defence. The average expenditure on the former since the commencement of the programme has been £150,000,000 a year. The target date by which the defence programme should be completed. This was fixed at 1952 and has been kept constantly under review in the light of the international situation. The effect on our manpower and productive resources of the number of ex-members of the forces withdrawn for rehabilitation training. The requirements of industry for manpower and material to provide for its transfer to a peace-time footing and for its post-war expansion. The man-power and material requirements of the national housing needs. The existence of an extensive reserve of war-trained ex-members of the forces whose services would be available in any emergency occurring during the development of the programme. The size of the defence effort is, therefore, determined by the proportions of the manpower and national resources which, having regard to the considerations mentioned, the Government is able to devote to defence. The form of the defence effort was resolved by those things which Australia could do best to co-operate in British Commonwealth defence. This is the first time in Australian history that there has been a defence programme giving continuity of development for five years, and providing for a programme of such magnitude. The planned strength of the Permanent Naval Forces is 14,753. The present strength is 10,148. Before the war it was 5,264. The programme also provides for a Naval Reserve of 7,500. The Navy has an aviation branch for the first time and will have two aircraft carriers. The local construction programme provides for the maintenance of a nucleus ship construction and repair industry capable of expansion in war. The planned strength of the Permanent Military Forces is 19,000. The present number is 14,861. The pre-war Permanent Military Force strength was 31,863. In those days, there was no field force establishment, nor was provision made in the Army structure for instructional or administrative cadres for existing militia units. This organisation is an essential prior requirement to building up the Citizen Forces and for providing a basis for their expansion by full mobilisation in war. The programme provides for a Citizen Force strength of 50,000 by June, 1952. The present strength is 16,459. Before the war it was 76,960, but, as already stated, there exists at present an extensive reserve of war-trained ex-members of the forces. The Army possesses modern equipment which, in its main essentials, is as good as exists anywhere today. Nucleus production capacity capable of expansion in war is maintained for its requirements. The planned strength of the Permanent Royal Australian Air Force is 13,092. The present strength is 9,073. Before the war it was 3,489. The strength of the Citizen Air Force will be 400. Also, there is an R.A.A.F. Reserve of former members of the air force still eligible for active service, qualified aircrew and tradesmen of the aviation industry, the present strength of which is 4,872. The programme provides for 16 squadrons, all of which have been formed. They have a unit equipment strength of 146 aircraft backed by adequate reserves of operational and other types of aircraft. It is the Government's policy to maintain an adequate aircraft industry capable of expansion in an emergency. In addition to the conventional types of bomber and fighter aircraft in production in Australia, the Vampire jet-propelled fighter with the Nene jet engine is being produced, and selections have also been made for the local manufacture of new types of jet bomber and fighter aircraft. Scientific and technical progress at the present time is so rapid that safety lies far more in the maintenance of an adequate organisation for pure and applied research than in the building up of stocks of obsolescent equipment. Accordingly, £33,500,000 has been included in the five years' programme for research and development in pursuance of the policy of undertaking a greater share of Commonwealth co-operation in defence. The Long Range Weapons project, costing £26,500,000, is the main item in the research and development programme. Modern warfare involves the total mobilisation of national manpower, economic and financial resources. Machinery is functioning for the preparation of plans on a national basis, the main bodies at this stage being the Joint Planning Committee for strategic and service planning, the Civil Defence Committee for planning civil defence measures, the Manpower Committee for planning the allocation of manpower resources and the Joint War Production Committee for planning the industrial war potential. The defence programme is essentially based on co-operation in British Commonwealth defence. Britain is the heart of the British Commonwealth, and it is vital to our own security and hers that we should render all possible support in the commitments which she has accepted under the Western Union and North Atlantic Treaties. Planning is actively proceeding between Britain, Australia and New Zealand on mutual defence, and it is the hope of the Government, when this is completed, that it will provide a foundation on which to build a wider arrangement with other nations with common interests in the Pacific. The Labor Government has faithfully carried out its duties and obligations in the field of international relations. The policy pursued has been based on a fundamental belief that the overwhelming desire of the people of Australia and of all countries, is that world peace must be preserved and the basis on which that peace can be built must be strengthened. In the troubled state of international relations today, there is an obligation on all to participate actively in the struggle for the maintenance of world peace and security. The Australian Government has made an outstanding contribution towards ensuring the effectiveness of the international machinery established to maintain world peace, order, security, and improved economic conditions. Two basic principles of foreign policy are of vital importance to all Australians. These are continued support for the United Nations, and the strengthening of the ties of the British Commonwealth countries. Australia is widely regarded as one of the architects of the United Nations and one of its most important members. Australian representatives have given unswerving loyalty to the fundamental purposes and principles of the organisation. The United Nations, and in particular the General Assembly and its various commissions, have become potent forces for the maintenance of world peace. By consistent advocacy of the settlement of international disputes after full and thorough investigations of all the facts, and insistence that methods of conciliation and mediation should be used, the Australian representatives have ensured that final decisions are based on principles of justice and equity. This policy has achieved important successes in Palestine, in Indonesia, and in lifting the Berlin blockade. It is assisting in the settlement of disputes in Korea, Kashmir and the Balkans. In the majority of these instances, Australian representatives have played active and constructive roles. No less important has been the part played by Australia in relation to the economic obligations imposed on members of the United Nations. Australian representatives have always insisted on the need for the members of the United Nations to take active measures to ensure for their peoples conditions of full employment and improved standards of human welfare. Conditions of world peace and stability will be achieved only in an atmosphere of economic and social progress in all countries. Improved economic conditions for the world as a whole rest on the willingness of each country to carry out the economic obligations imposed by the United Nations charter. In that way the United Nations will be a strong force operating against totalitarian and extremist political action. Australia's sincere belief in the need for improving living conditions for all peoples is further reflected in the material aid given by Australia in alleviating world distress. To the International Children's Emergency Fund alone the Government has contributed nearly £3,000,000. To this sum was added the £600,000 so generously contributed by the Australian people. Through participation in the work of such agencies as the International Refugee Organisation, the World Health Organisation, and the Food and Agriculture Organisation, the Australian Government is assisting in other fields in improving the lot of peoples throughout the world. Australia's influence has been marked in the field of colonial welfare. Australian initiative in securing a binding declaration by colonial powers to promote the economic, political, social and educational advancement of the inhabitants of dependent territories, has been followed by positive, contributions by Australian representatives on the Trusteeship Council of the United Nations which is responsible for the well-being of the peoples in these territories. This developing role in the United Nations has proceeded side by side with most active co-operation among British Commonwealth countries. This Government has repeatedly taken the lead in initiating improvements in co-operative consultation amongst British Commonwealth countries and it will continue to do so. In the last few years a new conception of the British Commonwealth has arisen. We have seen the growth of the new dominions of Pakistan, India and Ceylon. We have seen a far greater recognition by the Dominions of their responsibilities both in times of war and in times of peace which has resulted in the assumption of reciprocal duties by the Dominions and by Britain. The present concept of the British Commonwealth of Nations is is one of brotherhood which will bring together all the nations of the Commonwealth and all individuals who are citizens in those countries. Co-operation and consultation have improved in efficiency. Practical recognition of the part played by Australia in British Commonwealth affairs and in the United Nations is fully evident. Australia is the British Commonwealth member of the Allied Council for Japan, and as such represents Britain, India and New Zealand. An Australian is Commander-in-Chief of the British Commonwealth Occupation Forces in Japan. The respect with which Australia is regarded by other members of the United Nations is testified by the election of Australia to the Security Council on its establishment in 1946, her election to the Economic and Social Council for tho period 1947-50 and finally by the election of the Australian Minister for External Affairs as President of the General Assembly of the Organisation for 1948-49. Dr. Evatt's work as President has been universally acclaimed. The Labor Government will adhere to its policy of unwavering support for the United Nations and the British Commonwealth always pursuing its great objective of international peace based on the ideals of political justice, democratic procedures and economic well-being. An important factor in national defence, without which the armed forces are impotent, is the supply of fighting equipment. The provision of war material may be grouped broadly into the divisions of procurement and manufacturing, and the development of resources that are lacking. During the recent Parliament, the Government passed amending legislation, based on the experience of war, to enable the Commonwealth to exercise adequately the functions of supply and development in their relation to defence. The Minister of Supply and Development is a member of the Council of Defence. Departmental officials are members of the advisory and co-ordinating bodies concerned with the administration of defence policy. Arrangements are in train for serving members of the armed forces to be employed for periods in senior directing positions of the Department of Supply and Development. I have mentioned that the Government has instituted a five-year defence plan, estimated to cost £295,000,000. The allocations under the plan to the Department of Supply and Development are £17,500,000 for procurement and manufacturing and some functions of general development, and £33,500,000 for specialist research and development in respect or fighting equipment. The greater part of the £33,500,000 will be mainly in connection with the Rocket Range project. During the past three years a large scale plan for scientific research and development in respect of defence requirements has been planned in collaboration with the British Government. An organisation has been built up of highly qualified scientific and techhical staff and a considerable number of university graduates in science and engineering have been sent abroad for training. Extensive works for research and design and testing have been planned and are well under way. These arrangements are so well advanced that already there have been trials of fighting equipment of a highly secret nature. An essential feature in all defence planning is self-containment in raw materials which, if not available from the natural resources of the country, must be stock-piled. A special section of the department has been designated for examination of the needs and resources in respect of raw materials required. The Bureau of Mineral Resources will carry out a complete geological and geophysical survey of the Commonwealth. It is being equipped as quickly as practicable with the necessary staff and equipment so that the self-containment or otherwise of the Commonwealth in respect of minerals may be established. The Government has recently placed prospecting for and mining of uranium on the same basis as other metals and to guarantee a market by Government purchases. Many other minerals are equally important from the aspects of both defence and industry. Aluminium is an example, and the scientific and technical investigations necessary in respect of this metal have reached a stage whereby construction of the works has commenced. Government aircraft and munitions factories being maintained number 12, of which eight are of major defence importance. All the factories are undertaking commercial orders, thereby reducing the overhead which is inseparable from the maintenance of a defence potential. The Government has made arrangements and is considering further proposals designed to increase self-sufficiency in all aspects of aircraft production. In the Government's policy speech three years ago, I stated that it was our objective to develop in peace, resources for the manufacture of munitions and the supply of raw materials so that the Commonwealth might be made as self-supporting as possible in armaments and munitions of war, including aircraft and shipbuilding. I said that with the development of Government factories and the fostering of commercial industries, Australia was seeking to provide the widest possible base for a supply structure for the needs of the British Commonwealth in the Pacific. What I have stated tonight shows that we have gone far with our objective and that practically all the works necessary are under way. The Labor Government has a record of outstanding achievement in the field of social services and by its progressive policy has enabled the people of this country to build security against the social ills and hazards of life. When Labor took office in October, 1941, the only Commonwealth social service benefits were age and invalid pensions, maternity allowances and child endowment. The Labor Government greatly liberalised and extended the scope of these benefits and has introduced many new benefits covering fields not previously provided for. unemployment benefits, sickness benefits and special benefits in these fields. A comprehensive scheme of civilian rehabilitation has also been undertaken. Increases and liberalisations of social service benefits made by the Labor Government have been extensive and far-reaching. In 1941, the maximum rate of age and invalid pensions was 21/6 a week. It is now 42/6 a week. Allowances payable for the wife and one child of an invalid pensioner introduced in 1943 have been raised recently from 15/- to 24/- a week for a wife and from 5/- to 9/- a week for one child under 16 years of age. The means test for age and invalid pensions has been substantially liberalised. In 1941 an unmarried age or invalid pensioner was permitted to have, in addition to the full pension, an income of 12/6 a week and a married couple 25/-. These amounts have been more than doubled, the permissible income being now 30/- a week for an unmarried pensioner and £3 a week for a married couple. An unmarried pensioner may thus have pension and income totalling £3.12.6 a week, compared with 34/- in 1941, and a married couple may have pensions and income totalling £7.5.0 a week, compared with £3.8.0 in 1941. The income conditions for blind pensioners have been eased to an even greater extent. In 1941 a blind pensioner was permitted to have income of £3.7.6 a week in addition to the full pension. He is now permitted to have income of £5.17.6 a week in addition to the full pension, so that he may now receive by way of pension and income a total of £8 a week, compared with £4.9.0 in 1941. A married couple, both blind, may receive by way of pensions and income a total of £10.2.6 a week, compared with £5.10.6 in 1941. Since 1941 the value of property (apart from a home) which a pensioner may have without any effect on the pension has been raised from £50 to £100, and from £100 to £200 for a married couple. The total value of property (apart from a home) which a person may have without becoming ineligible for a pension has also been raised from £400 to £750, and from £800 to £1500 for a married couple. The provision under which a claimant for invalid pension was disqualified if he was adequately maintained by his parents has been removed in respect of claimants 21 years of age and over. Since the introduction of pensions for civilian widows in 1942, the maximum rates of these pensions have been increased from 30/- to 47/6 a week for widows with one or more children under 16 years of age and from 25/- to 37/- a week for widows over 50 years of age without dependent children. Pensions payable to other widows in necessitous circumstances have been increased from 25/- to 42/6 a week. The means test for civilian widows' pensions has been liberalised to much the same extent as for age and invalid pensions. Provision has also been made to enable a pension to be continued to a widow until her child reaches 18 years of age if the child is undergoing full-time education and is dependent on her and not in employment. The Government has abolished the means test for maternity allowances and has increased these allowances from £4.10.0 to £15 where the mother has no previous children, from £5 to £16 where she has one or two previous children and from £7.10.0 to £17.10.0 where she has three or more previous children. An extra £5 is paid for each additional child in multiple births. Provision has also been made for £5 of the maternity allowance to be made available at any time within four weeks prior to the birth. The Government has doubled the rate of child endowment payments, the present rate being 10/- a week for each child under 16 years in excess of one in a family, compared with 5/- in 1941. Special provisions have also been introduced to avoid any loss of endowment in cases where families become divided owing to the death or separation of the parents. The period of 12 months for which a person newly arrived in this country had to wait before qualifying for endowment has been abolished in the cases of persons taking up permanent residence in the country. In 1941 the Commonwealth had no provision for the payment of benefits during unemployment or sickness. These benefits were introduced in 1945. An adult or married claimant who is unemployed may receive a benefit of 25/- a week for himself plus £1 for a dependent wife and 5/- for one child under 16 years. The benefit is not affected by private income up to £1 a week. A claimant who is temporarily incapacitated through sickness or accident may receive the same amount in benefits, as well as £1 other income and £1 from a friendly society, and his wife may have income of her own up to 30/- a week. The Government has concluded a reciprocal agreement with New Zealand, the general effect of which is to enable persons proceeding from one country to the other for permanent residence to receive the social service benefits of the new country on the same basis as citizens of that country. The Government is now giving attention to the question of securing a comprehensive reciprocal agreement with Britain covering the various social services, so that, as far as practicable, people moving from one country to the other may do so without loss of benefits. The great expansion which has taken place in Commonwealth social services since Labor took office in 1941 is indicated by the fact that the total expenditure on these services has risen from under £18,000,000 before the war to an estimated £100,900,000 this year. The estimated expenditure on all Commonwealth social services, including the health benefits, for the year 1949-50 under the Government's programme is £100,425,000. The Government's programme of social security is directed to establishing a maximum degree of well-being and security below which no one should be permitted to fall and without waiting for anyone first to fall a victim to destitution and grievous distress. At the same time these barriers against adversity are not provided on a scale that eliminates personal incentive or a proper measure of self help. With the alteration of the Commonwealth Constitution by the referendum in 1946, specific powers were, for the first time, conferred on the Commonwealth Parliament to make provision for pharmaceutical benefits, sickness benefits and medical and dental services. The power to provide medical and dental services was sought by the Government and granted by the people in terms which expressly forbade any form of civil conscription. It is beyond question that the Government not only has no power to nationalise the medical or dental professions but that it never had any desire to do so. The past three years have seen developments of great importance to national health. The National Health Services Act authorises the taking by the Commonwealth of all steps necessary for the prevention, diagnosis and treatment of disease and the promotion of positive health. The rate of development of these national plans will be regulated by the availability of professional and auxiliary personnel and of labour and materials for the necessary buildings and equipment. The Commonwealth Government has initiated a drive in co-operation with State Governments to bring tuberculosis under control in as short a time as possible. The Commonwealth has agreed to provide the whole of the additional money required by the States for this purpose. The Commonwealth will bear the cost of all additional buildings, plant and equipment and all additional maintenance involved in putting the plan into effect. This plan is prevention at its best. It is hoped that every citizen will co-operate fully in this attack on a disease that is the greatest killer of our people in their most fruitful years. The Labor Government has arranged for the establishment and maintenance at Commonwealth expense of a Chair of Child Health at Sydney University. The chair will be concerned with the post-graduate training of doctors in the diseases of children and will conduct research in that field. The Labor Government has increased the amount available to the National Health and Medical Research Council for medical research from £32,000 in 1946/47 to £60,000 a year. Following the passing of the Acoustic Laboratories Act in 1948, the Commonwealth has set up acoustic laboratories in five States and is about to establish a laboratory in the remaining State. These Laboratories are concerned, on behalf of the Department of Repatriation, with the provision and servicing of hearing aids for ex-service personnel whose hearing has been adversely affected. They have conducted experiments with school children affected by deafness. The Labor Government authorised the appointment of a Director of Dental Services. After discussions with the Australian Dental Association, it is proceeding with national plans for public education in nutrition and dental hygiene, the provision of dental facilities for outback areas, and of complete dental attention for all children up to 16 years of age. The Government believes that bio-chemical and pathological tests and facilities should be readily available to all people to aid the medical profession in their diagnoses and treatment. New Commonwealth Health Laboratories have recently been opened at Wollongong, Albury and Tamworth making a total of 16 laboratories in Australia. In the main their services are free. The Government intends to establish more laboratories throughout Australia as departmental medical officers complete their training as pathologists and bio-chemists at the School of Public Health and Tropical Medicine. The Government recognises the urgent need for more hospital beds, particularly in convalescent and chronic stages of illness. The Government is aware, too, of the need for additional nursing staff; and to an appreciable extent has been able to relieve the more urgent needs of hospitals for domestic staff and to some extent for trainee nurses by arranging for immigrants to fill vacancies on hospital staffs. But the main obstacle to any rapid expansion in hospital facilities at the present time is the shortage of labour and materials. Until these physical limitations are overcome—and I have already referred to what the Government is doing in this direction—no spectacular increase in the number of hospital beds available for all cases will be possible. The Labor Government has been active in giving effect to its belief that there should be substantial or complete relief from the financial burden of disease or sickness. A payment by the Commonwealth to each State Government 8/- a day for each occupied bed in the public wards of a public hospital is made subject to the condition that no charge is made to the patient. As a result, accommodation, medical treatment and nursing and medicine are available throughout Australia, without charge of any kind, to every patient in a public ward of a public hospital. A payment of 8/- a day is made by the Commonwealth towards the hospital expenses of every patient in an approved private hospital or in an intermediate or private ward of a public hospital. The Commonwealth Government has concluded arrangements with four State Governments whereby, in consideration of payments made by the Commonwealth towards the cost of maintenance of a mental patient, no charge for accommodation, medical treatment, nursing or medicines is made to the patient or to his relatives or against his estate. It is hoped that the other State Governments will soon conclude similar arrangements with the Commonwealth. The Labor Government's proposal to provide useful drugs and medicines prescribed by a medical practitioner without charge to the people was launched in June 1948. At that time it was left to each medical practitioner to please himself whether or not he co-operated in the scheme. When, after a year's trial, it was found that, because of the attitude of the Federal Council of the B.M.A., there was no general co-operation from the medical profession, the Government passed an Act obliging a medical practitioner who prescribed within the scope of the Commonwealth Formulary to write the prescription on a Commonwealth form and so set in motion the machinery that would enable the patient to have the prescription dispensed without charge. The validity of this Act was challenged in the High Court by the Government of Victoria and by the British Medical Association. The court's decision has been given and the Government has now decided that there will be no change in the present form of the Pharmaceutical Benefits Scheme, which continues to operate on a basis of voluntary co-operation by doctors. All members of the public are now dependent for the free supply of penicillin, the sulpha drugs, insulin, liver extract, biological products, tablets, and many kinds of important medicaments on the goodwill of their doctors. Use of the forms and the formulary is the only system that will enable the scheme to function without embarrassment to patients, to chemists and to efficient and economical administration. The Government had deferred the setting up of the formulary committee—a body to be charged with the revision and expansion of the formulary—pending receipt of the High Court decision. The B.M.A. has hitherto declined to nominate its members to serve on that committee. The Government will establish that committee at an early date without B.M.A. nominees unless that body reverses its decision. The Commonwealth Government has decided to launch a scheme whereby the Commonwealth will pay one-half of approved fees charged by medical practitioners to their patients. While, at the outset, this scheme may not embrace the full range of specialists services, it will, as rapidly as possible, be expanded to include them. The degree of co-operation extended in the provision of benefits by State Governments, the dental and pharmaceutical professions and the proprietors of private hospitals has been extensive and gratifying and is in marked contrast to the attitude of the controlling body of the British Medical Association. In the three years since the 1946 general elections, the Labor Government has put into smooth and successful operation the greatest and most imaginative immigration programme in the nation's history. I give this promise—that the great immigration drive launched by the present Government in 1945 will not abate in vigor until Australia has the population it needs to achieve the full development of all its resources and to guarantee its security from outside attack. The fruits of the Labor Government's immigration programme are already being enjoyed in the form of increased production; and already the shape can be seen of the great and powerful Australian nation of 20,000,000 people. At our projected rate of population increase resulting from the excess of births over deaths and from planned immigration, most Australians now living should survive to see their country inhabited by 20,000,000 people. An Australian nation of 20,000,000 dedicated to those same ideals of democracy, liberty and international fair dealing which inspire Australians of today, will be a powerful influence for justice and peace in the world of tomorrow. The Government is proud of what it has been able to achieve in immigration with the co-operation and support of overseas Governments, the State Governments, and a host of private organisations and persons throughout Australia. It has tackled and overcome some very difficult problems of the selection of migrants, shipping for them, and provision for their reception and accommodation. New settlers are being brought to Australia in numbers greater than those attracted by the gold rushes of the last century. In the two years up to last June, about 160,000 permanent new settlers came to Australia. Of these more than 76,000 arrived in the first six months of this year, about two-thirds being financially assisted by the Government. In the 12 months ending next June, we expect about 170,000 new arrivals, and thereafter an even greater flow of migration in the years ahead. Apart from the vital defence and security considerations, there is also every economic advantage to Australia in immigration. Additional workers are needed immediately to fill employment vacancies in industry and to develop basic resources. There are no prospects of meeting all the demands for workers without migration. Australia is getting large numbers of migrants from Britain and from areas controlled by the International Refugee Organisation in Europe, together with Maltese, Dutch settlers and others from many sources, who have brought with them a wide range of skills which are now being used in Australian industries. For instance, more than 40,000 former displaced persons have been placed in employment ranging from the production of building materials, building construction, and domestic service including work in hospitals and institutions to defence work, food processing, the manufacture of clothing and textiles, iron and steel production, mining and quarrying, public utilities, and work on farms and stations. About one in eight has gone to work connected with the building industries. As a result significant increases can be seen in the output of many items such as timber, bricks and household fittings. With the expansion of immigration, there will be many problems and difficulties to be overcome. These are inevitable and the Government will tackle them with the same vigour and determination that have been brought to the tasks of getting the migrants. It is of vital importance for the future of Australia that all the increase in the population does not go to swell the capital cities. Development must, as far as possible, mean an economic growth in regions outside the big cities. Immigration as extensive as we intend to achieve throws out a challenge as well as an opportunity to the Australian people and to all sections of industry, particularly those engaged in the all important basic industries. It demands forward planning on an unprecedented scale. To assist in the consideration of these and related matters, the Government has set up an Immigration Planning Council which will advise on the economic and industrial implications of immigration and consider ways in which immigration can best contribute to the development of the Australian economy, with close regard to the need for decentralisation and a wide general distribution of our expanding population. The Council will consist of leading men from a wide range of industry and others with special knowledge of economic and individual problems. The Labor Government recognises that Australia's economy is closely linked with the agricultural, pastoral and other primary industries and during the last Parliament, it directed many measures towards ensuring their continued prosperity. In 1939, Australian primary industries, due to a decade of low prices, were in a deplorable condition, and their sad plight was reflected in lower living standards among other sections of the community. When it took office, Labor's programme was immediately devoted to increasing farmers' incomes, and improving their standards of living. The Government used its war-time powers to provide organised marketing and guaranteed returns for many primary products. Returns to producers generally were increased to payable levels, in some cases through the granting of subsidies. Subsidies were also paid to absorb some of the rising cost of materials required by the farmers and to assist them in adverse seasons. This assistance was given producers when defence expenditure was very heavy. It lifted farmers' incomes and by the time war finished, most producers had regained their financial strength. They were able, therefore, to take greater advantage through increased production, of the high prices since prevailing overseas. The coming of peace and the subsequent disappearance of war time powers presented the Government with the problem of devising means of ensuring continued prosperity for farmers. I stress that unless powers are delegated by the States, as in the case of wheat, the Commonwealth Government has no power for marketing or price fixing within the Commonwealth. Marketing of potatoes, oats, barley and a number of other products has, therefore, reverted to the States. Commonwealth Government guarantees for them have necessarily been discontinued, since, to implement a guarantee arrangement, there must be some physical control or supervision over the product concerned. The Government's efforts, therefore, have been directed to ensuring stable and payable markets overseas for exported products. It has the necessary Constitutional powers for this purpose and has provided legislative and other assistance. To ensure that wheat, meat, butter, cheese, eggs, apples and pears would continue to be advantageously marketed in future years, legislation has provided Export Control Boards for those commodities. These boards have majority representation of producers. Long-term contracts for the sale of exported meat, butter, cheese, eggs and dried fruits have been entered into with Britain, which continues to be our best market. The Government considered it was sound, when high overseas prices prevailed, to make contracts for long periods, thus ensuring future markets and payable prices. It accordingly secured a seven years' contract for butter and cheese; a five years' contract for eggs; and five years for dried fruits. In addition satisfactory short-term arrangements have been made in respect of wheat, canned fruits, fresh apples and tallow. When I visited London this year, I obtained the British Government's approval for a 15 years' contract for meat. This contract is not yet finalised but it is expected to supersede the existing agreement which expires in 1950. The assurance of a continuing market resulting from the agreement will enable the Government and individual producers to plan expansion of the meat industry and give Britain greater supplies. Already plans for the development of beef production in Northern Australia are taking shape. The wool agreement under which 10,000,000 bales of war-time surplus wool stocks and current clips of Australian, South African and New Zealand origin are being marketed, has been most successful and may terminate in 1950. The bulk of Australian stocks has been sold. When the remainder has been cleared the balance of the profits will be distributed to growers who supplied wool to the Central Wool Committee during the war. The liability of £40,000,000 which the Government undertook in re-purchasing a half share of unsold Australian wool, has been met, and Australia's profits when all surplus wool has been sold, are expected to be from £55 to £60 millions. An interim payment of about £25 million has been approved by the Government and it is expected that this will be paid to growers by the end of this month. The Labor Government has indicated to other participating governments its willingness to be represented at a conference early next year which will consider the possibilities of a post-Joint Organisation Wool Marketing Scheme. The plan which the Labor Government sponsored for stabilising the wheat industry through joint Commonwealth and State legislation, is now in operation. The plan provides a guaranteed price based on production costs, covering all the wheat consumed in Australia, plus 100 million bushels of export wheat. The guaranteed price to growers for the 1948-49 season was raised to 6/8d. a bushel. A further survey of costs was made recently, and the finding will influence the guarantee for the present crop. The Labor Government desires the stabliisation plan to be a continuing one, giving growers guaranteed prices for a reasonable period ahead. It will, therefore, confer with State Governments and growers' organisations at the end of the third year of operation of the present plan regarding its extension. The Australian Government was a signatory to the International Wheat Agreement, which came into operation last August. Canada, U.S.A. and Australia, as exporters, agreed to supply a large number of importing countries, including Britain, with 456 million bushels of wheat in each of four years. Australia's quota under the agreement is 80 million bushels a year. Devaluation of Australian currency with the dollar resulted in a substantial rise in returns in Australian currency under the agreement. The maximum price is now expected to be raised to around 16/- a bushel, for the four years, and the minimum price to about 13/5d. in the first year and down to about 10/8d. in the fourth year. In 1947, the Government put into operation a five years plan to stabilise the dairy industry. It guaranteed producers their production costs and undertook, after yearly surveys, to vary the guarantee to meet any rise or fall disclosed. The Advisory Committee's report in 1947 resulted in a guarantee of 2/- a lb. commercial butter, equal to 2/5 a lb. butter fat. In July, 1948, the committee reported that costs had increased by 2d. a lb. commercial butter, and in 1949 a rise of an additional 2½d. a lb. These increases in costs were granted to the industry. It is now on the soundest basis in its history. Dairy farmers' organisations have asked the Labor Government to extend the scheme for a further period. As in the case of wheat, the Government favours a continuing plan and will consult with the industry at the end of the third year of operation of the plan. In 1948, a new seven years' contract was entered into with Britain for the sale of surplus butter and cheese. Record prices were obtained. The Labor Government was also successful in having placed in the contract a clause providing against price variation of more than 7½% in any one year. This protects the industry against a return to disastrous pre-war low prices. The Labor Government made a grant of £250,000 a year for five years commencing last year for the promotion of efficiency and increased production in the dairy industry. Record prices are being obtained for eggs, exported to Britain under the terms of the five years' contract that started last July. This contract also contains a clause preventing variation of more than 7½% in the contract price in any one year. The new price of 2/7d. a dozen for shell eggs is based on a survey of the production costs made at the Government's direction by the Bureau of Agricultural Economics. It compares with a contract price of ½d. a dozen in 1939. Poultry farmers have benefited from sales of fowls, chickens, ducks and turkeys to the British Government, which have been negotiated by the Commonwealth Government. This valuable outlet for poultry augmented Britain's supplies to the extent of 9,000 tons in 1948-49 and this year the quantity may reach 12,000 tons. Financial and other assistance given to the Australian Apple and Pear industry maintained its stability when its export markets were closed during the war. The Apple and Pear Marketing Board acquired the crop in Tasmania and Western Australia until the end of the 1947-48 season under war-time powers. During last season, at the request of the Tasmanian and Western Australian Governments, it again marketed the apple crop of these two States. The Commonwealth agreed to meet any losses sustained by the respective governments in making advances to growers. For the incoming crop in Western Australia and Tasmania the Government has agreed to continue the plan successfully operated for the past two years and to raise the guaranteed payments to growers by an average of sixpence a unit. Legislation was provided by the Labor Government for the reconstitution of the Australian Apple and Pear Board. This board has powers to control exports of apples and pears from the Commonwealth and will be in operation in the coming export season. A satisfactory five years' contract for seasons up to 1953 for the sale of Australian currants, sultanas and lexias, was arranged by the Government. Under this contract, currant and sultana prices were advanced by £10 and £5 (Australian currency) a ton respectively, on those paid during the previous contract. The British Ministry of Food has agreed to purchase 1,750,000 cases of peaches, pears and apricots from the 1949 pack. It is hoped to obtain a further substantial order for sales from the 1950 pack. Substantial help was given through Government act in directing new Australians to work in the industry. To assist primary production, the Labor Government has continued the subsidy on superphosphate. This has cost £14,500,000. The Government owns and operates four sulphate of ammonia plants, thus reducing Australia's dependence on overseas supplies. This fertiliser has also been subsidised by the Government. The cost this year will be £500,000. Rural production during 1948-49 exceeded £600,000,000 for the second successive year, compared with an average of £211,000,000 during the five years ended 1938-39. This remarkable increase in farmers' returns has resulted mainly from higher overseas prices and good seasonal conditions. The Labor Government's help to primary industries in the early war years and its financial assistance during adverse seasons enabled the producers to stimulate production and to take advantage of the good markets. Private enterprise was incapable of financing marketing on such a vast scale. Commonwealth Government finance and government-to-government trading are inseparable from the marketing of primary products to the best advantage of producers. Expansion of Australia's export trade is complementary to national development and essential to its programme of full employment. The Labor Government is giving active assistance to manufacturers and exporters in finding and developing export trade, by modifying or removing export handicaps and by forming export panels representative of various industries. Australian Trade Commissioners are now posted in 18 world trading centres. Legislation was passed by the Labor Government this year establishing the Australian Whaling Commission. A most important development in Australian agricultural economics has been the cost of production surveys undertaken at the direction of the Government by the Bureau of Agricultural Economics. Surveys of production costs of wheat and dairying industries were made in conjunction with representatives of those industries and accepted as the basis of the Government's guarantees to them. Survey of costs in the egg industry and the pig industry enabled the Government to successfully present a factual case to the British Government for an increased price in those products. We live in a scientific age, and money spent on research is a necessity for the maintenance of our standard of living and even for our survival. Since the Labor Government came into office eight years ago, it has increased the vote of the Commonwealth Scientific and Industrial Research Organisation five-fold. That organisation now covers a wide field of primary and secondary industries, and has some 800 investigators, plus some 2,000 other staff, at work in the fields of plants, animals, insects, soils, foods, forest products, fisheries, physics, chemistry, radar, irrigation, building materials, meteorology, dairy products and flax. The fruits of this work are many. Now an old industry is helped or a new industry started; now the primary production of a whole region is lifted. There are many large areas, particularly in the north, where science can play an outstanding part in development. The Government is accordingly using the organisation to survey the land-use possibilities of all the various regions of the north whose agricultural and pastoral conditions show promise. Already some 250,000 square miles of the Katherine-Darwin region and the Barkly Tablelands have been covered, and studies of the Ord and Burdekin River regions are in progress. Successes are becoming more and more numerous. One of the latest is the discovery that by applying small amounts of the sulphates of zinc and copper to the soils of the 90-mile desert between Victoria and South Australia—a procedure costing a few shillings per acre—a former waste region of some 2,000 to 3,000 square miles can be brought into comparatively high production. Yet another success is in the field of flax. Types of bacteria have been obtained which give an efficient retting treatment and produce high grade fibre well up to the world's best. Fisheries work has led to considerable increases in the Australian fish canning industry. Investigations of timber have evolved several ways of avoiding waste of this important material. Research workers in radar have evolved direction-finding and other radio equipment which is now being installed and which seems destined to give civil aviation in Australia safety aids ahead of all other countries. New developments the organisation has in mind relate to wool textiles and to coal. There is every reason to believe that the comprehensive and fundamental work that will be carried out on wool will enable Australia to meet the threat of artificial fibres to the all-important wool industry. Fuel research is another field which it is hoped to enter at an early date. The importance that fuel will play in the further development of this country is obvious. It is, therefore, of particular importance that studies should be made of how best to use coal, particularly the extensive brown coal and semi-bituminous coal of the south. The organisation is tackling the rabbit problem. The intention is to set up a section to study the life history and habits of the rabbit in the hope of discovering a weak link through which the pest can be attacked by new methods or by modifications of the old which the pest has so successfully resisted in the past. Australia now has a powerful instrument whereby to raise the living standards of all her people. The Government intends to support and develop that instrument to the full. The Commonwealth Governnent recognised in 1945 that there would have to be a concerted effort to speed up the erection of homes and I informed you in 1946 that the Government had initiated the Commonwealth-State Housing Agreement. This is a co-operative venture, whereby the Commonwealth advances the finance to build the homes and has guaranteed to stand three-fifths of any losses incurred. The States do the erection of the homes and their allocation. I am pleased to be able to report that, to date, over 23,000 homes have been erected and a further 10,000 homes are at present under construction. A total of £51,000,000 has been advanced to the State Governments to finance the scheme. The programme of construction has been stepped up each year since the war as the figures will show. In 1945/46, 2,825 homes were completed; in 1946/47, 4,887 homes; in 1947/48, 6,370 homes, and in 1948/19, 7,743 homes. A further increase on this figure is expected for the current year. The Commonwealth-State Housing Agreement is an assurance that the low-income earner can secure a good home at the rent he can afford because of the assistance rendered to him under the rental rebate system. The Commonwealth Government is directly responsible for the provision of War Service Homes. An energetic drive has brought about a step up from 428 homes in 1945/46 to 6,084 in 1948/49. At 31st July last, 5,180 homes were under construction, indicating that a considerable increase can be expected for the current year. Financial aisistance to ex-servicemen has been increased from £950 to £2,000. The group home construction with its special attention to war widows is another progressive step introduced. The insurance cover afforded to ex-servicemen was further improved. The cover is comprehensive and compares more than favourably with that of private companies. In all housing fields, the number of dwellings erected last year was over 52,500 and some 60,000 were under construction. The average for ten years under anti-Labor Governments before the war was 27,000 homes a year. In addition, the Government recently offered to assist all State Governments to import 10,000 pre-fabricated houses. The coal shortage remains serious. New South Wales production this year may reach 10,800,000 tons, or about 900,000 tons less than in 1948. This deficiency arises mainly from the recent general strike. The coal shortage, although accentuated by strikes, derives fundamentally from the current inability of the industry to meet the rapidly growing requirements of the community. If 1949 had been completely free from strikes, production would still have fallen about 1,000,000 tons short of requirements. This fact emphasises the urgency and importance of the Joint Coal Board's programme for the re-organisation and re-equipment of the industry and for the expansion of productive capacity. This estimate makes provision only for Australian consumption and for bare minimum export commitments to Pacific Islands. It does not allow for the recapture of Australia's export markets nor for any increase in stocks of coal in the hands of consumers. If industrial disputes were entirely eliminated, the industry would be in a position to produce about 13,600,000 tons of coal annually. With industrial disputes causing losses of between 1,500,000 tons to 2,000,000 tons a year, it will be seen that it is necessary to expand production by about .50 per cent within the next five years. This is an extremely difficult task, but the board expects that it will be achieved. Steel production is held back firstly by the shortage of coal, and secondly, by the shortage of labour, which cannot be obtained because of the shortage of building materials for housing. The re-organisation of the coal industry is retarded by the shortage of steel and of labour, which again depends on housing for the community as a whole, and for the coalfields and the steel centres in particulnr, is delayed because of the shortage of steel and coal. This shortage affects not only those industries (such as bricks, cement, tiles) which use coal directly, but also other building materials industries (such as timber) which rest heavily on a rail transport system which is unable to carry the freight offering because of lack of coal. To meet the increasing demand for coal, the Joint Coal Board has engaged in an extensive prospecting programme. This has been done by 35 geological investigations. Altogether 133,754 feet of drilling have been done in New South Wales. As a result of this work it has been proven that 35,000,000 tons of commercial quality coal is available for open-cut mining. During 1949, substantial improvement in production capacity was made at 34 mines in New South Wales. The work carried out included the introduction of further mechanical units, of improved haulage and man transport facilities and of improved pit-top arrangements. In addition, the use of power borers became general in New South Wales mines, 616 units now being in operation. During 1948/49 the capacity of New South Wales underground mines increased from 47,600 tons a day to 50,300 tons a day. Due to shortages of manpower and materials, it has not been possible to proceed with the mechanisation of all mines in New South Wales, but substantial progress has been mnde in 41 mines. To assist owners to mechanise their mines, the Board has purchased a large quantity of machinery which is available either for hire or for purchase. While there has been an improvement in the American supply position and deliveries of American coal loaders are well ahead of schedule, cutters, shuttle cars, transformers and other ancillary equipment of British and local manufacture are behind schedule. The cost of equipment ordered is £1,858,000. This is a first instalment of the mechanisation plan. When installed this equipment will increase production capacity by about 12,000 tons a day. Of the total estimated cost of £19,500,000 to bring the coal industry up to date, over £6,000,000 is needed for the overhaul and replenishment of existing mines so present production can be maintained. Nearly £13,500,000 is needed to develop the industry to give the estimated increased production needed. During 1949/50, nineteen open-cuts will be in operation and £1,250,000 is being spent on the purchase of excavators, cranes, tractors, drag lines and other coal and earth-moving equipment to mechanise the open-cut mines. Increased production means added transport problems. The Department of Railways in New South Wales has undertaken a major expansion programme to handle the increased coal production the board is planning. The main Western line to Wallerawang will have to be electrified and the number of rail tracks increased from two to four, while 2,000 additional 40-ton coal waggons are required. The Railways Department, although hampered by lack of steel, is engaged on the construction of rail sidings. To handle the production of open-cuts, the board has designed a portable standard screening, crushing and loading plant. Eight of these plants have been ordered at a cost of £63,000. Three of these plants are installed at Renown and Newdell, and one is being installed at Branxton. To enable the contemplated increased coal production from the western districts of New South Wales to be shipped interstate, the N.S.W. Maritime Services Board, in co-operation with the N.S.W. Railways Department, is constructing a new coal-loading wharf at Pyrmont. The Commonwealth Employment Service was established in 1946. Besides aiding workers to find jobs and to improve themselves and helping employers to obtain the workers they need, the service provides an advice and information service to all. A major function of the Commonwealth Employment Service is to assist British migrants to find employment. An even greater task relates to the displaced person scheme. The Commonwealth Employment Service not only canvasses for vacancies, but checks accommodation and wages and conditions of employment, and whether Australian labour is available that could be employed. Officers of the Commonwealth Employment Service are stationed at Naples, they travel on vessels to Australia to record all details of each individual that will assist in his placement and on arrival special officers allocate the Displaced Persons to vacancies, arranging movement to the place of employment. Placements are made in a restricted range of employment, principally in industries and services that are vital to the Australian economy, that are starved for labour and upon whose development the Australian economy and the Government's plans for its expansion depend, and under circumstances to avoid depriving Australians of accommodation. Increased production and improvements in the physical conditions under which workers are employed and the circumstances surrounding their employment go hand in hand. Considerable contributions have been made by the Labor Government in these spheres. The activities of the Department of Labour are at present directed particularly to the improvement of physical working conditions in the fields of lighting (natural and artificial), heating, ventilation, safety, general design of structures, orientation of buildings, provision of amenities, encouragement of industrial canteens, participation of employees in works activities, reduction of labour turnover, and the like. To provide a closer liaison with the States, and generally endeavour to raise the standards appearing in the Factories Act, by agreement with the State Ministers for Labour, the Commonwealth and State Departments of Labour Advisory Committee reviews the standards proposed as the result of research activities by the Commonwealth Department in the hope that, progressively, the States will write these new standards into their Factories Acts, or, alternatively, that the state Factories Inspectors will use these higher standards in their advisory work. The incidence of accidents which are avoidable, and the presence in Australian industry of hazards to health are very high. It is believed that with proper attention to protective measures, coupled with advice to industry on hazards and their elimination, training in industrial safety, and the development of industrial health services, much can be done to reduce loss of productivity. On the return of the Labor Government to office, particular attention will need to be given to the question whether the Commonwealth should give leadership in the field of industrial safety. The Government is kept in touch with all industrial happenings which may bear on industrial peace, and thus enables the Minister for Labour and National Service or the Government to take appropriate action, either by ensuring that the matter is brought speedily before the appropriate industrial authority or that other action is taken to preserve or restore industrial peace. The Industrial Relations Division provides an information service to both sides of industry, particularly in relation to Awards of all Commonwealth authorities, and, to a lesser extent, in relation to Awards of other authorities, particularly where there is some problem of relationship to Commonwealth Awards. Special attention is now being given to the need for reviewing the whole of the circumstances surrounding apprenticeship and it may be that, with the return of this Government to office, special consideration will need to be given to the Commonwealth bringing together all concerned with a view to reviewing existing apprenticeship conditions in the light of present day requirements. Since the establishment of the Stevedoring Industry and Maritime Industry Commissions during the war, the Government's policy has been to provide for the speedy settlement of industrial disputes and for the safeguarding and improvement of the working conditions of employees in these industries. In consequence of the work of these commissions, an organisation and an improvement of conditions generally in these industries have been effected which has contributed to industrial peace. An efficient and adequate manning of vessels has been maintained while the gang roster system has been of considerable benefit in providing regular waterside labour. Recently the Stevedoring Industry Commission was replaced by a Board of three members, and the industrial functions hitherto performed by the commission were transferred back to the Arbitration Court. The levy on the industry which provides funds for the board's administration has been reduced from fourpence halfpenny to twopence halfpenny per man hour. In the stevedoring sphere, the Government plans, through the new board, to continue the improved conditions won for the industry by the commission, and to move steadily towards the speedier loading and unloading of ships and their quicker turn round in port. The Government is confident that through its administration machinery on the waterfront, the latter objective will, in due course, be achieved. In the maritime sphere, the Government plans the continuation of the Maritime Industry Commission, and through this body the speedy settlement of ship disputes and the minimisation of delays of vessels. Since the war years, the Government has pursued a planned, progressive policy in regard to the shipping and ship-building industries. The war emphasised the great importance of these industries to the adequate defence of the Commonwealth and showed the deficiencies in the size and modernness of the Australian merchant marine. Since 1945, the shipping position has gradually improved, but the tasks of rehabilitation and the resumption of many important projects necessarily deferred during the war, have maintained the demand for shipping space at a high level. Without the assistance of Commonwealth-owned and chartered ships, privately-owned vessels would have been quite incapable of meeting the post-war shipping demands made on them. The Government, therefore, continued to operate its own vessels together with overseas chartered ships and was compelled by circumstances to continue until August, 1947, the requisitioning of privately-owned vessels, from which date these vessels were returned to their owners. During the war, the shipbuilding industry was rehabilitated and an extensive programme was undertaken for the construction of new and up-to-date vessels for the Australian coastal trade in Australian shipbuilding yards. The Government plans to pursue vigorously its policy of fostering the shipping and shipbuilding industries. To this end, the Government during 1949 passed the Shipping Act which is designed to ensure that all vessels (with exceptions to meet special cases) for use on the Australian coast will be built in Australian shipyards. It also provides that (again with exceptions to meet special cases) vessels will be replaced as they reach 24 years of age. These provisions are intended to ensure that not only will there be a permanent market for the output of the Australian shipbuilding yards, but also that the Australian merchant marine will be maintained in a reasonably modern and up-to-date condition. To prevent an undue rise in the cost of new vessels to Australian shipowners, which in turn would mean increased freight rates, the Government has planned to provide financial assistance to the shipbuilding industry which, it is hoped, will enable shipowners to secure ships at a price comparable to prices ruling in British shipyards. Fears have been expressed that the Government may use the provisions of the Act to prevent private shipping companies from securing the vessels they need. These fears are groundless, as the Government is anxious to encourage private companies to place orders in Australian shipyards. Several companies already have placed orders, and the Government has sold two of its newest vessels to private firms. The Shipping Act also provides for the setting up of an Australian Shipping Board which will operate a Commonwealth Shipping Line. The line will operate in the Australian coastal trade and will continue to supplement services being provided by private shipping companies. There is still pressure on shipping, and the Government is satisfied that there is ample room in the coastal trade for both privately-owned and the Commonwealth Line to operate, and also that with the continued expansion of industrial activity and development of the Commonwealth, there will be room for expansion of both the Commonwealth and private fleets. The Commonwealth Line is intended also to be used to provide developmental services to places which have hitherto not been served by shipping, or which have been inadequately served. It is hoped through these services to assist the decentralisation of Australian industry and the economy generally, and to facilitate the more rapid development of areas suitable for industrial and agricultural purposes. At a later stage, when the coastal position permits, it is hoped that it will also be possible for Commonwealth-owned vessels to operate in overseas services. The Government is determined that, in a future emergency, there shall be in being an adequate and efficient ship-building industry and a modern and up-to-date merchant marine, capable of meeting the tasks which war will impose. The defence aspect is an additional and compelling reason for the Government's direct interest in both shipping and ship-building. These two industries are of such vital importance to the defence of the Commonwealth that their expansion and maintenance on an adequate scale cannot, as in the past, be left to the uncertainties of commercial enterprise. The Government's re-establishment of Australia's hundreds of thousands of ex-servicemen and women was a special phase of the application of the fundamental Labor principle of full employment. The Commonwealth Reconstruction Training Scheme is one of the world's most ambitious adult education programmes, and undoubtedly, in proportion to population, the greatest re-establishment measure conceived and carried through by any country. Since 1944, the scheme has steadily developed into a Commonwealth-wide organisation working under a democratic administration of representative committees. It has provided free tuition and equitable living allowances for tens of thousands of trainees. It opened opportunities for thousands who would never have had them in the ordinary course of events. At the end of last June, 150,000 ex-servicemen and women were engaged in full-time and part-time training at universities, technical colleges, rural training centres and elsewhere, while a further 50,000 had already completed courses of preparation for over 400 different occupations. By the time the scheme is complete, more than one in every four of the men and women who served in the armed forces and their auxiliary services will have seized the opportunities provided by the Commonwealth Reconstruction Training Scheme. In terms of lasting benefit to the nation, the value of the scheme cannot be overestimated. The £38,000,000 it has cost has provided, and is providing, Australia with doctors and carpenters, dentists and electricians, nurses and artists, lawyers and bricklayers—a small army of professional men and skilled artisans. But what is equally important, in the view of the Labor Government, it has provided the means whereby men and women may lead happy and satisfying lives of productive service for the Australian community. One of the most successful phases of re-establishment has been soldier land settlement. The Government's opponents were critical of the slow start. But the Government had in mind the disastrous failure those same critics made of land settlement after the first war, when thousands of young men's hopes and tens of millions of your money were sacrificed in over-hasty, half-baked land schemes. The Labor Government has subjected properties to the most rigorous examination as to their productive and economic suitability. It has ensured that a proper home-maintenance area was allotted in every case. The Government has developed the land and, to the extent of availability of materials, fenced it and made adequate housing provisions. Settlers have been chosen carefully and nearly £1,000,000 has been spent on giving them special training before leaving them to work their own way. Already nearly 5,000,000 acres have been allotted to 3,000 settlers; and another 12,000 men have received loans to acquire or improve blocks of their own choice. Thus 15,000 have already benefitted to the extent of £18,000,000 of Commonwealth money spent in land acquisition, in loans and advances, in living allowances to tide them over the first year's settling down. In the face of these achievements—achievements of a sort which point to success and not tragedy in the future the Opposition critics have become silent. The Labor Government has broken new ground in the medical treatment, training and employment of physically handicapped ex-servicemen not eligible for benefits under the Repatriation Act. Thousands of ex-servicemen suffering from various disabilities have been returned to civil life with an assured, congenial and independent future. The success of the scheme was so pronounced that the Government decided to extend it to civilian members of the community—invalid pensioners and recipients of sickness benefits under the Labor Government's social service legislation. Apart from its tremendous significance as a means of personal rehabilitation, the scheme will eventually mean a saving of tens of thousands of pounds annually in the payment of pensions and social service benefits, while adding to tho productive forces of the nation. The guarantee of employment to all. So that many Australian secondary industries may be maintained and developed it is essential that Australia should obtain from overseas large quantities of capital plant and equipment; raw and partially manufactured raw materials; and, under present circumstances, supplies of steel. Many of these commodities are in short world supply today and either cannot be obtained at all or are available only in limited quantities from sterling area and easy currency sources. Although those sources of supply have been thoroughly combed, it has been necessary for Australia to allocate substantial quantities of dollars and other hard currencies for the purchase of those goods. Complete new plants, in many cases of dollar area origin, have been licensed for use in many important industries which, in the long-term view, will be of the greatest importance to the economy of the Commonwealth. These industries include the tinplate project to be carried out at Port Kembla (N.S.W.) and open-cut coal mines on a large scale in Victoria. Secondary industries could not function unless import licences were granted for raw and partially manufactured materials, such as textile goods and yarns, to be used for processing and finishing in the Commonwealth. Here again, as in the case of capital plant and equipment, the countries of the sterling area and the easy currency countries have been combed for these commodities. But it has been necessary to provide hard currency funds for the importation of those goods from such countries as Western Germany and Japan in addition to providing dollars for the importation of many types of raw and partially manufactured raw materials. It has been necessary for Australia to import increasing quantities of iron and steel products from abroad. The quantity of these goods which Australia can obtain from within the sterling area and from easy currency countries falls far short of requirements. It has been necessary to allocate substantial quantities of dollars and other difficult currencies, such as Belgian francs, for the importation of galvanised iron, wire netting, fencing wire and rods for concrete reinforcing. The Government has not been unmindful of the requirements of primary industries. Large dollar allocations have been provided for the importation of American wheel tractors and for certain components for the production of tractors in Australia. By the latter means, the Australian economy will benefit by the encouragement of local production of tractors. Dollars have been provided for the importation of commodities such as pest eradicators and fumigants for the destruction of rabbits. In the Labor Government's plan to promote an economically sound Australia, trade relations occupy an important part. Australian producers need markets for a growing diversity of exports and sources of supply for the raw materials used by our industries, and other essential goods. Without these our standard of living would not rise and could even decline, For this reason the government has taken steps—by means of tariff negotiations—to afford Australian industries every opportunity to sell their products in world markets. At the same time, it has made every endeavour to assist local manufacturers in obtaining supplies or urgently needed raw materials in world short supply, such as manganese ore, pulp and paper and inedible oils and has assisted in the procurement of goods which are indispensable to primary producers. The Australian Government has been pressing for the abolition, or at least the reduction, of the unduly restrictive measures which so hampered world trade during the immediate pre-war period, But mere reduction of unduly restrictive trade barriers is not enough. At all meetings of the United Nations Trade and Employment Committee, the Australian delegates have stressed the need to create conditions in which it will no longer be necessary to impose these barriers, conditions in which the legitimate aspirations of the peoples of the world can be realised in ways which do not in any way impair the interests of other countries. Australia's representations led to the inclusion in the Charter for an International Trade Organisation of articles which recognised that the avoidance of unemployment and the maintenance of a large and steadily growing volume of production and effective demand for goods and services are not only of domestic concern, but are necessary for the achievement of world-wide economy and social progress and development. But, although adhering to the general view that barriers to world trade should be reduced, the government maintains that protective rates of duty have a legitimate place in the tariff schedules. Protective duties should be capable of being applied when they are used as devices for building up industries appropriate to the Australian economy. But the grant of protection to producers must be regarded as a privilege which carries with it the responsibility of maintaining the highest possible level of industrial efficiency. Protection in the past has been granted on the advice of the Tariff Board, and the government proposes to continue to rely upon that body. Although the Australian Government has agreed in general terms to the reduction of Imperial preferences, it has accepted this principle only on the clear understanding that any reduction will be effected as the result of a mutually advantageous bargaining process whereby Australia receives equivalent tariff concessions in compensation. The government fully appreciates the importance of the tariff in assisting in the development of a sound and balanced economy but is also appreciative of the fact that on occasions the net interests of Australia are best served by permitting the importation of many goods at by-law rates of duty. Many building materials such as corrugated roofing, reinforcing rods, conduit piping and steel plates and sheets in short supply or unprocurable in Australia have been permitted entry under by-law. In every case the Australian economy has benefitted and in no case have the interests of any Australian industry been sacrificed. Whenever the opportunity has occurred the Government has reduced or eliminated primage duty in an endeavour to remove any unnecessary costs of these imported goods. So that the interests of Australian industries and of the Australian export trade may be safeguarded, the Government is closely observing the effects on world trade and their possible repercussions on Australia of the recent devaluation of the Australian pound in relation to the United States dollar and various other currencies, and, whenever necessary, will take appropriate action to meet contingencies. The policy of the Labor Government is designed to bring about the establishment of a sound economy based on efficient and prosperous primary and secondary industries. It is the intention of the Government to achieve this objective, to follow the broad principles I have outlined. Continued development along present lines affords bright hopes for the economic future of our country. The effectiveness of transportation is vital to the national well-being during this post-war era of rapid development. The Commonwealth Labor Government has obtained the co-operation of all State Governments in the setting up of the Australian Transport Advisory Council. This Council has been very active in the urgent field of co-ordination of transport. The Commonwealth Labor Government is pursuing its policy for the standardisation of railway gauges. It has become necessary for the Commonwealth to negotiate for separate agreements with individual States and agreement has been reached already with South Australia. The necessary legislation has been introduced and the Commonwealth Government will assist South Australia by providing £171,000,000 towards the project. Negotiations are proceeding with Victoria and Western Australia with the same objective. Valuable surveys have been made in Western Australia and South Australia, while a detailed investigation into the national deficiency of locomotives and rolling stock has been completed. The Commonwealth Government has given very substantial assistance to the States, towards the construction and maintenance of roads. In 1947/48 the Commonwealth contribution for roads was £6,200,000; in 1948/49 it was £7,600,000; and for 1949/50 £9,000,000 is provided. This makes a total of almost £23,000,000. In making this contribution the Commonwealth has been aware of the problems and difficulties faced by people living away from the capital cities and big towns and who, under such difficulties, play so important a part in our economy. The Commonwealth Government has expressed this recognition in a practical form, and no less than £6,000,000 has been reserved for roads in remote areas during the three years mentioned. The extent of this assistance to the man on the land can be gauged by the fact that in 1948/49 funds were approved for no less than 581 local government bodies. The increasing number of accidents and casualties resulting from heavy road traffic has received the attention of the Government, and an annual sum of £100,000 has been provided for the past three years for road safety purposes. The Post Office serves practically every settled part of Australia and the importance of adequate and convenient communication services to the community needs no emphasis. The Government has tackled post-war problems with vision and energy and, even before the war ended, a special programme of new works had been planned. Despite difficulties in obtaining skilled labour and materials, an amount of £20,700,000 was spent on new capital works during the financial years 1947/48 and 1948/49, and it is estimated that more than £14,000,000 will be spent during 1949/50, bringing the total expenditure for the three years to nearly £35,000,000. By its prompt and realistic action, the Government has shown that it is solidly behind the plans of the Post Office to meet the greatest emergency that organisation has ever faced. For the first time in its history, the Post Office has been authorised to proceed with its developmental planning on a long range basis with the knowledge that, subject to the acceptance of the Budget by Parliament, the necessary funds will be available from year to year. At the same time, the Government has introduced more liberal conditions governing the provision of facilities, with particular emphasis on services in rural areas, including new and extended mail services, house-to-house letter deliveries, increased hours of attendance at telephone exchanges, the opening of many new post offices, and the raising of others to official status. The establishment of automatic exchanges in rural areas has received special attention, and the plans provide for 650 new exchanges of this type to be installed. Already 192 rural automatic exchanges are in operation, of which 51 have been installed in the past 2 years. establishment of a large number of rural automatic exchanges designed specially to meet the needs of outback areas. The introduction last July of increases in certain postal, telegraph and telephone rates was made because of increased annual costs of £13,000,000, due chiefly to rises in wages of Post Office employees and the additional costs of materials, particularly those imported from overseas. Australian postal, telegraph and telephone charges remain among the lowest in the world. The Post Office, in common with private business and other public utilities, must pay its way, and the overall increase of 16% is very moderate in comparison with the additional charges for goods and services imposed by privately operated public utilities and business undertakings. Television has been engaging the attention of the Government for some time and it has studied closely the latest developments in overseas countries. The Broadcasting Control Board has been authorised to prepare an overall plan for the introduction of a National Television Service. Standards to meet local conditions have already been adopted and tenders for providing transmitting equipment in the capital cities are under consideration. Frequency modulation, with its capacity to provide for transmission on the higher wave lengths, has definite possibilities, particularly in improving service to people in rural areas. The plans covering the overall development and expansion of broadcasting services will embrace this alternative system of transmitting programmes. Australian civil aviation, both at home and abroad, has grown out of all recognition during the life of the Parliament that has just ended. During the war years, millions of pounds were spent on airports and aircraft for the R.A.A.F. But most service aircraft were unsuitable for civil flying and most service aerodromes were not situated where they would be of most use for civil operations. The Department of Civil Aviation has successfully negotiated the transition from war to peace. It has built up an organisation capable of handling the greatly increased amount of air traffic and communications facilities required. It has created and improved new airports in the capital cities and in the outback. It has laid down new standards of fitness for pilots and the airworthiness of aircraft. It has negotiated important air transport agreements with countries overseas. The Commonwealth Labor Government created Trans-Australia Airlines, which is carrying passengers at the rate of almost 50,000 a year and is operating over a network of 13,500 unduplicated route miles. The growth of the people's airline in only three years is a unique achievement. Civil aviation has revolutionised life in the outback. Every community is within a day's flying of a capital city and medical help is never more than a few hours away. Distant places are no more. Australian air fares are among the lowest in the world. When the Labor Government took office, our air routes outside Australia were less than 5,000 miles. Today, they are more than 26,700 miles. The Department of Civil Aviation is introducing new electronic equipment costing £6,500,000 so that ground facilities will keep pace with the growth of air traffic. Nearly £14,000,000 has been set aside for the improvement of 134 airports in all States, during the next three years. The Labor Government has not allowed financial consideration to decide whether Australia should have essential equipment for the development of civil aviation, especially where safety is concerned. But the money is being well spent. The economics of each new piece of equipment and each new service are closely investigated. All sections of the community benefit from an efficient airways system. We will further develop airports and air navigation facilities, so that we will be ready to cope with the heavier traffic expected and additional demands imposed by the use of jet aircraft. New air routes will serve communities not yet receiving the benefits of air transport. Australian operators will be encouraged to use the best and latest equipment, and provide a service to the community which is second-to-none. Fortunately, the world is now looking to Britain for the latest ideas in air travel, and the purchase of new aircraft should not involve large dollar expenditure. There will be no relaxation in safety standards. We will try to improve them, as experience shows that improvement is necessary. Whatever new developments there may be, Australia will not be lagging behind. The Labor Government recognises that primary responsibility for education remains with the States. At the same time, war and post-war experiences have shown that many aspects of education could be satisfactorily undertaken only with more direct Commonwealth participation. Although much has been achieved, Australia is as yet only on the threshhold of a vast expansion which will require leaders of vision and trained judgment, scientists and technicians, commercial leaders and administrators. The Universities Commission was established by the Labor Government to maintain in war-time the flow of graduates from science and other faculties. Since the end of the war it has been concerned mainly with the administration of the university and professional training side of the Commonwealth Reconstruction Scheme and of the Commonwealth Scheme of Financial Assistance for University Students. Under the latter scheme over 5,000 boys and girls, on leaving school, have had their university or senior technical school fees paid and have received living allowances from the Commonwealth. Recently the Government completed arrangements for a Commonwealth Scholarship Scheme which will assist 3,000 students selected competitively to commence university or senior technical studies each year from 1951 on far more generous terms than under the existing Financial Assistance Scheme for University Students. State Universities have received from the Commonwealth Labor Government over £3,000,000 in buildings, equipment, subsidies and fees. The Commonwealth now makes available over five times as much as pre-war for the vital business of training research workers and developing research in State universities. Meanwhile the work of establishing the great National Research University at Canberra is making excellent progress. The Commonwealth Office of Education has many responsibilities. Not the least important is the work it does with new settlers from Europe. The Office has also broken new ground in adult education for Australians generally. It has been, moreover, the Commonwealth's link with education progress abroad. Since 1946, the Government has welded the Department of Information into a compact national publicity organisation which tells the rest of the world what Australia has to offer to the immigrant, the tourist, the trader, the investor and the industrialist. The efforts of this Department play a large part in maintaining and increasing goodwill towards Australia in other lands which was earned during the war. It co-operates fully with other Government Departments. It maintains, news and information bureaux and information libraries at London and New York, and at 12 overseas points officers are acting as public relations officers or press attaches to Australian Diplomatic Missions or to Trade Commissioners. Without the help of the Department of Information, Australian immigration authorities in Britain and in Europe would not be able to work so effectively in getting new citizens here not only in quantity, but also of the very best quality. The Department of Information can organise overseas the national publicity which will bring large numbers of tourists, many of them from dollar-currency areas, to our shores. Because of shortages of shipping and of accommodation within Australia for pleasure-travellers, no major moves to encourage tourists have yet been made. However, it seems likely that the next large national cmnpaign which the Department of Information will have to conduct will be one to bring tourists here, and to spread the story of Australia in their own countries when they return. In the hands of the department, such a campaign will be carried out with vigor and skill. The Labor Government has taken active steps towards the establishment of a National Theatre. At the last Premiers' Conference the Government offered to provide £30,000 to bring high-class productions to Australia and to establish a reserve for the operation of a National Theatre Company if the States were prepared to allocate a similar sum between them. At the same time, the Commonwealth offered a further £20,000 to provide for overseas scholarships for the training of actors and theatrical technicians.